I am missing the launch of a new book, Perspectives on Preaching: A Witness of the Irish Church, in Christ Church Cathedral, Dublin, this evening [22 January 2018]. I am one of the 12 contributors to this new book, published by Church of Ireland Publishing (CIP) in conjunction with the Church of Ireland Theological Institute (CITI). It is being launched this evening by Bishop Ken Good of Derry and Raphoe, in the Music Room of Christ Church Cathedral, Dublin. The new book, featuring contributions from a wide range of notable preachers and theologians, has been edited by Canon Dr Maurice Elliott, Director of CITI, and the Revd Dr Patrick McGlinchey, Lecturer in Missiology and Pastoral Studies at CITI. My chapter is titled ‘Preaching and Celebrating, Word and Sacrament: Inseparable Signs of the Church’ (pp 77-90). In 12 chapters, this new publication engages with the themes of preaching Scripture, denominational charisms and preaching to the culture. The editors have been my colleagues on the academic staff at CITI. Dr Elliott writes ‘On the Book of Common Prayer and the task of preaching,’ and Dr McGlinchey writes about ‘Preaching to the De-Churches and Unchurched in Contemporary Ireland,’ and also pens the ‘Conclusions’ to this book. In all, eight of the 12 contributors are from the Church of Ireland. If there are weaknesses in this book then, perhaps, then they include the fact that apart from Archbishop Clarke and me, the other six Church of Ireland contributors approach the topic from an evangelical, and even a ‘conservative evangelical’ perspective. The 242pp book sells at €11/£10. 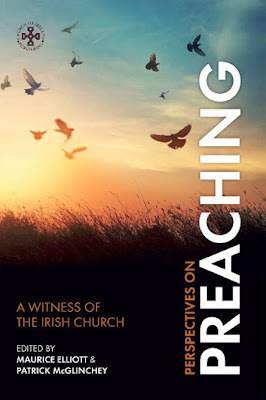 It is available at this evening’s launch and is also available through this link: https://store.ireland.anglican.org/store/product/140/perspectives-on-preaching-a-witness-of .